The nails that I'm honoring today for the last day of the 31 Day Challenge inspired by Sarah from Chalkboard Nails, Day 17 - Midnight Mermaid Glitter Placement mani. 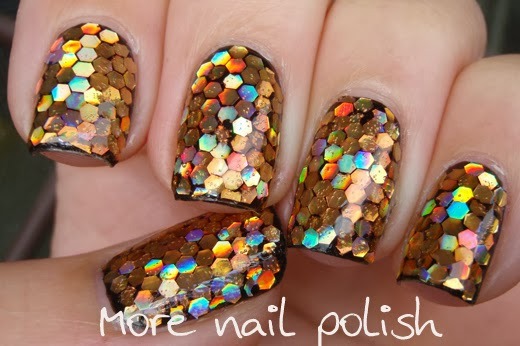 Now I'm sure I read somewhere that you should never attempt a mani that you saw on one of your favorite nail art bloggers, because you will never be able to create something as good as they originally created. But knowing I didn't have exactly the same products, meant my mani would be quite different and gave me enough confidence to tackle it myself. I'm so glad I did, cause I feel like I finished the challenge with bang with this mani. 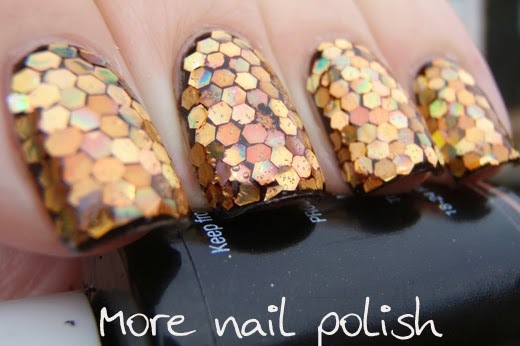 I don't have any dot glitter, let along holo dots, so I selected one of my favourite dark gold hex holo glitters and attempted a full glitter placement mani. I too prayed to the goddess of glitter placement, Polish all the Nails, and I followed her guidance to start with a single line done the middle of the nail, and then work outwards from there. I even tried to cut my hexes in half to fill in some gaps, but bloody hell, it's nearly impossible to cut a piece of glitter in half people! 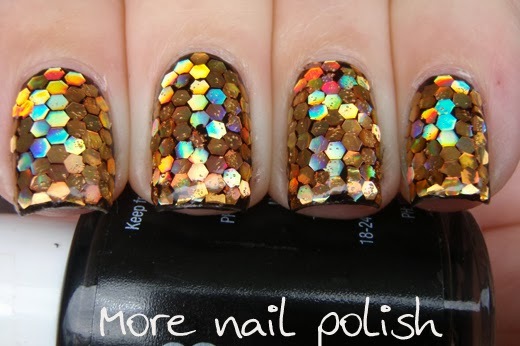 Are you read for the holo - OMG it's mesmerizing. I cheated on my right hand and didn't do glitter placement. I just painted top coat on and then used my left hand index finger to press onto the loose glitter on the table and then press it onto my nail. The effect was close enough to complete the mani. I even created an animated gif just like Sarah did to show off the awesome holoness. 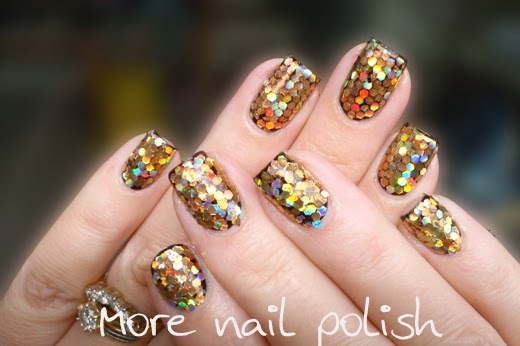 My favorite color is gold, and when it's holographic it's even better, then you get your favorite color too, rainbow! I love these!! And you did amazing work throughout the challenge! Not a single flop, unlike me, lol!! I would be crying when the time comes to taking these off.....so pretty!!!!! 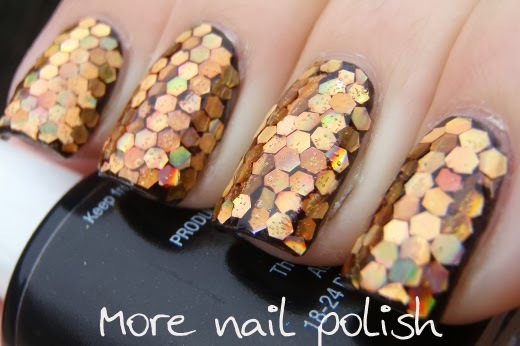 Yes, they do look like honeycomb! Thanks for the inspiration for this art and for getting me involved in the whole challenge. Yayayyayayayay this looks even better than on Instagram! You did such a good job, I want to see more now! 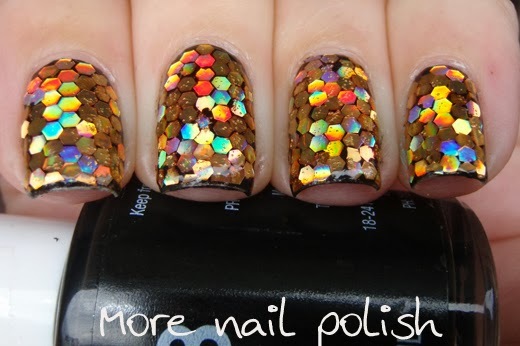 It's nice to see other people like to line up glitter nicely too, as well as cheating on their other hand. No one notices, right?? Thank you so much! I want to do more too, but i think I need to buy some more glitters, I wish I had some slightly smaller ones like the ones you use. I wonder if anyone has ever done both hands as a full glitter placement?? It would take me at least 4 hours to do that!! This are ballistic! Just like Chalkboard! Only way to describe them! too awesome for words!! love!! These look amazing! 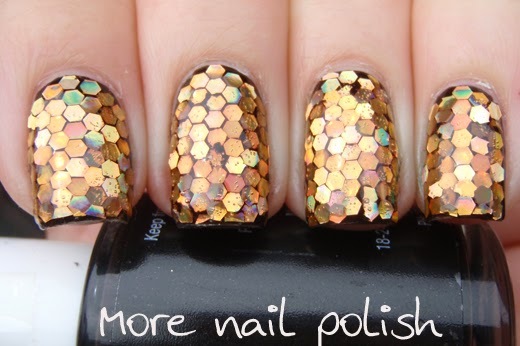 The holo effect is stunning :) it does look like a honeycomb! This is stunning. I love it!